As the gaming world eagerly awaits the latest entry into the mega-popular and highly controversial Grand Theft Auto series, The New York Times has taken a step back in time with a trip to Melrose Park, Ill, where Stern Pinball continues to operate a 40,000-foot pinball warehouse--the last of its kind. It's a bittersweet piece about the death rattle of an industry, featuring quotes that can't help but make you feel for those profiled, such as, "There are a lot of things I look at and scratch my head. Why are people playing games on their cellphones while they write e-mail? I don't get it." That one's from Tim Arnold, a former arcade owner, who adds, "The thing that's killing pinball is not that people don't like it. It's that there's nowhere to play it." 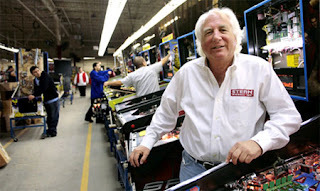 But the factory's owner, Gary Stern, who inherited the family business from his father Samuel, posits that despite its tough times, pinball isn't going anywhere.